This is my eleventh year of operating the ARRL DX Contests from VP9GE. I'm still enjoying it. the reflector half of the boom broke. I didn't notice any change in performance though. The commercial power went out for about three hours. Ed and I pulled a generator out but I missed an hour of a great run on 15 metres. Highlights: Working many of the people that I have met over the years. 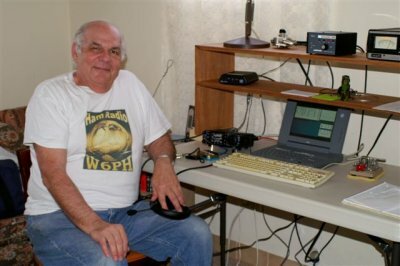 One of my favorites is Vic, N4XR, who was contesting as W1EOB before WW2 and is still an active contester in his 90's. For the first time in at least five years I had several six band contacts. N5AW, N4KG, NR5M, K0RF and K0SR come to mind. 10 metres was not very strong as compared to the Caribbean, just a few good signals from Texas and the west. Fifteen metres was much improved from the past few years. I didn't hit 40 metres until the European sunlight. There just wasn't any frequency available from 7.0 to 7.1 before then. I missed a couple easy multipliers which I couldn't move at the right time. Analyzing the cost per contact, it comes out to be about 16 cents per contact not including the cost of a QSL. I will be back in VP9 for the Phone contest. Special thanks to Ed, VP9GE, for his great hospitality and friendship.